We’d all love to spend quality time with our dogs during the day, but it’s often not possible. That’s why we offer the next best thing: a safe, fun place for your pup to stay when you can’t be with them. And just because you’re not with them they won’t be far away: we have live webcams that allow you to watch your pup play all day! Dogtopia of Stoughton is Massachusetts’s premier destination for dog daycare, boarding and spa services. 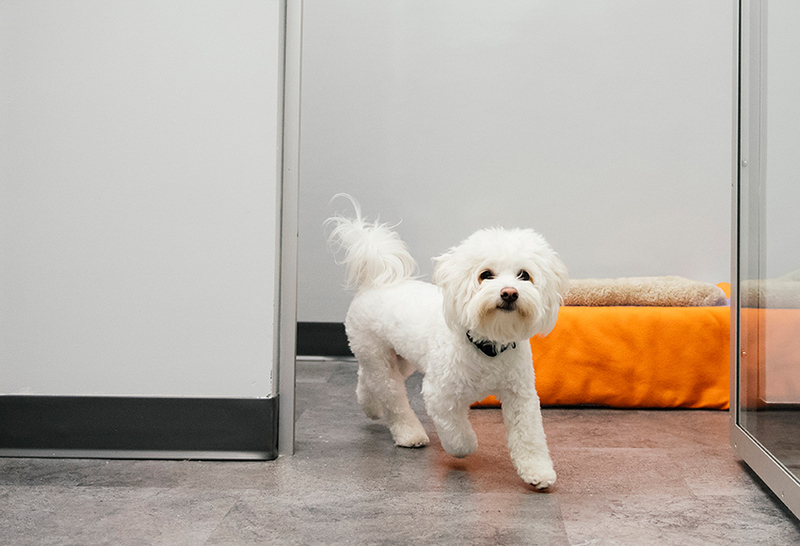 We make it our personal mission to ensure that your furry family member is well taken care of by a devoted team of professionals in our brand new, spacious facility. We chase the absolute highest standards of safety in everything we do! Our goal is to make sure all pups in our care are happy, safe and comfortable. Our webcams let you check in on your pup from any desktop or mobile device. Have peace of mind their safe and comfortable while you’re away. We realize that your dog is a furry member of your family and they deserve the highest level of care. That’s why we offer expert advice and tips on a wide range of topics related to dog behavior, health, safety and more! Favorite Activities: Getting pets from our playroom attendants, smiling, keeping an eye on all the dogs! We proudly serve Stoughton and the surrounding towns of Canton, Brockton, Randolph, Sharon, Avon, Walpole, Dedham, Westwood, Norwood and Easton. If you live in the MetroWest Boston area, the South Shore or even Boston itself we’re here for all your dog care needs! SHOPPING, DINING, COMMUTING OR WORKING OUT? We’re close to Legacy Place in Dedham and University Avenue shops and restaurants in Westwood, as well as the Rt 128, Canton Junction, Canton Center and Stoughton MBTA train stations. We also are conveniently located near the Lifetime Gym in Westwood. 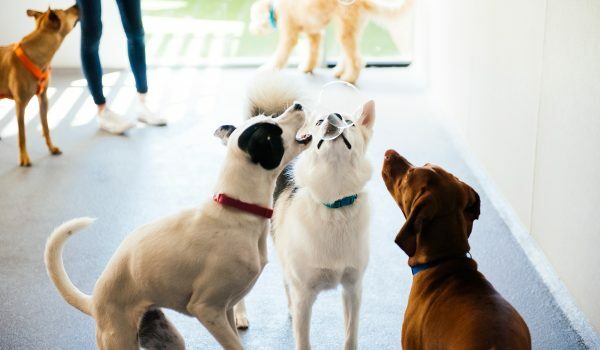 Whether you want to drop your pup off for a half day or a full day while you’re busy shopping, enjoying a meal, working out or want a safe, clean and fun place for your dog while you’re at work we are nearby! 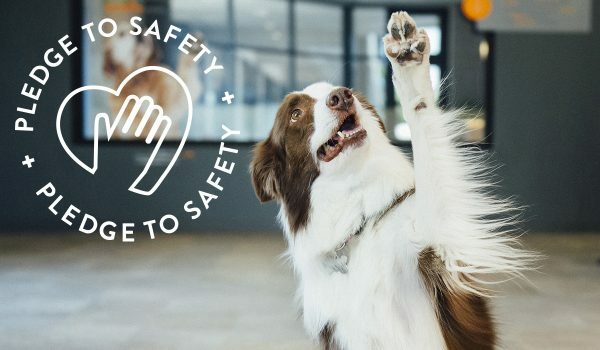 Our number one priority is your furry family member’s safety; the moment your pup is in our good hands, their well being will be the last thing you’ll need to worry about! We have a 5-star rating on Facebook, with most of our reviews mentioning our professional and friendly staff, the cleanliness and maintenance of our facility, and how happy their dog is to visit us every day. Dogs feel their best when they’re able to play with others, burn off excess energy, and learn new skills. We offer all that and more at Dogtopia of Stoughton. Our structured play offers valuable socialization skills, and teaches your pup how to better behave around humans and other dogs. Not only will your dog’s behavior improve at daycare, you’ll also see a difference at home and in other social situations, like dog parks. Our team strives to make your pup feel as comfortable as possible during their time with us. 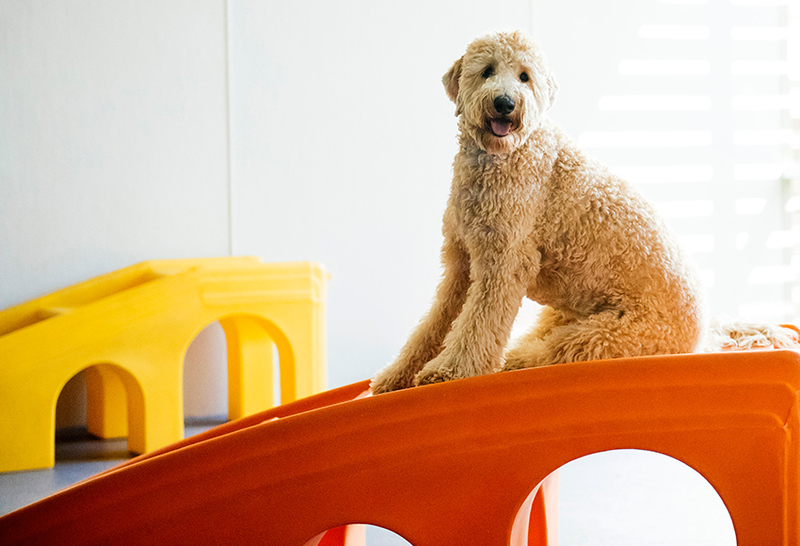 Dogs are separated into different playrooms based on their size, play style and personality, ensuring your pup enjoys off-leash, open play in a warm and safe atmosphere. Whether your dog needs a place to run around with their best friends during the day (complete with naptime! 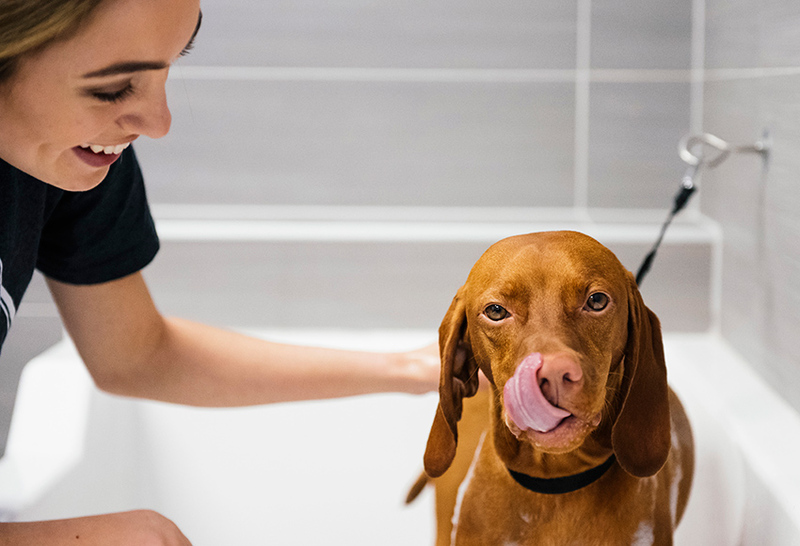 ), a home away from home while you’re out of town, or some pampering in our doggie spa, our caring team will be there to love your dog like you love your dog. We open early and stay late (M-F 6:30 AM–7:30 PM and 10 am–5 pm on the weekends.) We’re even open 365 days a year! Please contact us for a no-obligation tour of our facilities. We can’t wait to meet you and your dog and prove to you it’s the perfect place for your pup! We’re a proud member of the Stoughton Chamber of Commerce, and a supporter of the American Cancer Society, Spaulding Rehab Hospital and Stoughton Police Department. Bill Polk and the whole team are happy to welcome you our new location, which opened in December 2017, the first nationally-branded Dogtopia in the Northeast. Our beautiful, brand new 3000-square foot facility is special in every way. 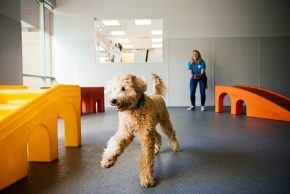 From our live webcams where you can watch your dog all day, to our stringent cleaning practices using pet-friendly professional solutions, to our climate controlled HVAC systems that keep our indoor playrooms continually circulating fresh air that’s the perfect temperature, we’ve carefully designed the space to be most beneficial to your dog. Our Support Office staffs an Environmental Biologist and a Canine Behaviorist who have designed a custom curriculum to ensure your dog enjoys structured days of play that are full of exercise and basic training techniques. Our team works with all different size dogs, breeds and temperament and can identify and detect the smallest difference in your dog’s body language and act accordingly. 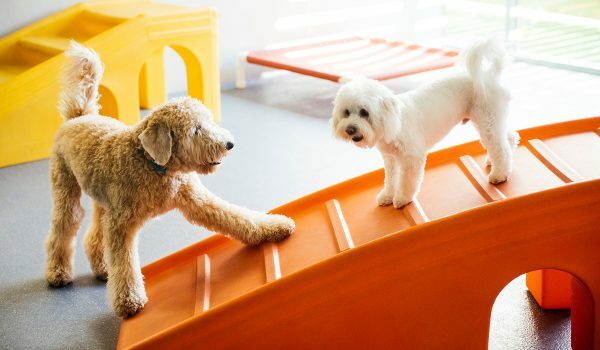 Our Playroom Attendants are highly trained, passionate about dogs, and ready and happy to take care of you pup during our daycare, boarding and spa services. We’re near the heart of Stoughton, located in the Stop & Shop plaza on the main business route that is home to all of Stoughton’s major businesses, banks, restaurants and grocery stores. Located near MBTA train stations in Stoughton, Canton, Legacy Place and the Rt 128 station in Westwood, you can find us on Rt 138 in historic Stoughton, bracketed by Interstates 93 & 95 and Rt 24. Whether you’re going to the Cape or flying out of Logan, we’re on the way! If you want to schedule your dog for daycare, boarding or spa services, please contact us to arrange a time and date. Before you bring your dog to stay overnight, we ask that you bring them in for a FREE meet and greet with our staff. This will include vaccination confirmation, a review of your dog’s history and health, nose to tail assessment, and an evaluation of your dog in our open-play environment. 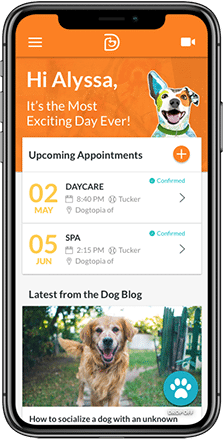 Both the evaluation and any portion of that first eval day you can leave your pup with us is completely free. Please feel free to fill out our contact form or call us at 617-241-3999 if you have any questions about any of our services. Our friendly and knowledgeable team will be more than happy to answer any questions you may have and determine if we are a right fit for your pup. You can also download our enrollment form here.